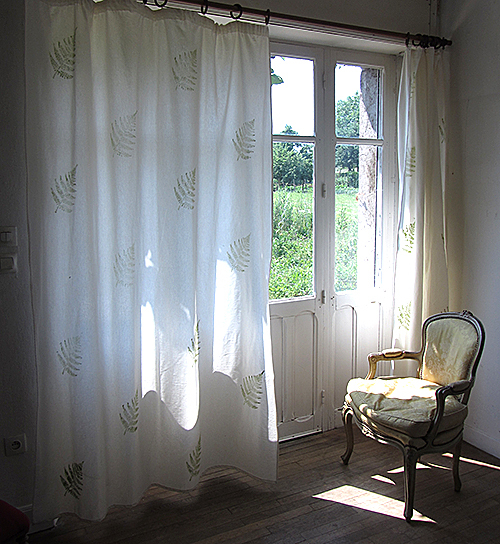 My mum bought a house in the French country side a couple of years ago. It used to be a farm until around early 20th century. It was then slightly transformed to become partly a café (we are told farmers used to visit the café while their horses where with the blacksmith across the road) and partly a family home. Needless to say my mum has done a lot of work in order to be able to live in the house and still has a lot to do on the decoration side of things. 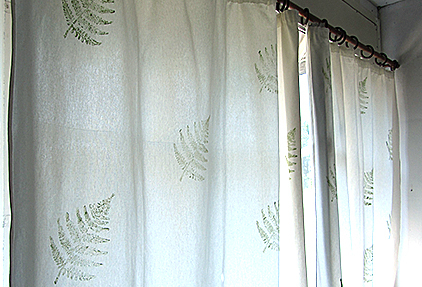 She asked me if I could print some fern pattern for her room curtains. I happily accepted the job. 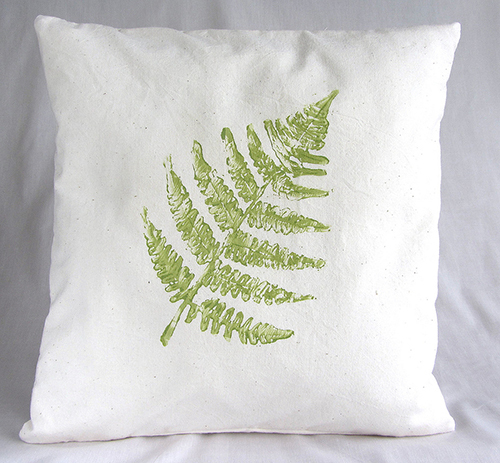 I drew a fern on some lino and carved it to block print the fabric she had chosen (a medium weight cotton-linen mix). We decided to keep a lot of white space between each fern so it does not look to busy. It works well with the French door and the view on the back garden. I kind of fell in love with the pattern itself so I decided to re-use it to make some pillow covers. They are available in my Etsy shop. It also inspired me into working on a botanical range but I am not sure yet which plant will be next! I am sure you have noticed this house is wonderful. I have more pictures to share with you all later. I have to say I felt very inspired by the house, it was as if each room was screaming for some hand made decor! I love it. The curtains look very expensive.